The adaptive gripper DHDG consists of a pneumatic drive and three gripper fingers with Fin Ray Effect, derived from the movement of a fish’s tail fin. The structure is based on two flexible bands which come together at one end to form a triangle. Intermediate struts at regular intervals are connected to the bands via joints. 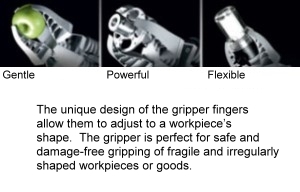 This flexible but firm design allows the gripper fingers to adjust to a workpiece’s shape. Pneumatic cartridge valves take pneumatic system design to a new level. Pneumatic cartridge valves replace large, cumbersome direct piped valves with a small package size that has a high flow rate to size ratio. All external piping is eliminated. The only connections are incoming air and outgoing system connections. 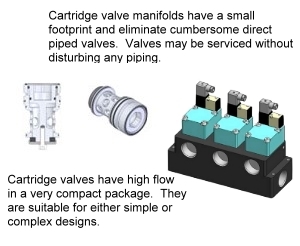 Because of their compact design and generous size flow passages, cartridge valve manifold systems have lower pressure drop compared to conventional designs. Reduced pressure drop dramatically increases overall system efficiency. Vision Color Sensor specializes in every type of color. Conventional color sensors have to pass when dealing with luminous objects or the "non-colors" white, grey and black. The Vision color sensor from SensoPart knows no such limitations – it not only "sees" objects of any shape and color but on top of that also supplies additional information on color intensity and the position of the object sought. There is no question about it: where conventional sensors only see grey on grey, SensoPart Vision sensors are full of color!